The federal trial challenging Michigan’s redistricting system is being watched closely around the country. DETROIT – Call former state Rep. Brandon Dillon a sore winner. The Grand Rapids Democrat testified Wednesday that he voted against the GOP-lead redistricting maps in 2011 – even though it made Dillon’s own seat a sure-fire lock for him or any Democrat. Dillon’s testimony came on the second day of trial in a federal lawsuit challenging state legislative and congressional districts drawn by Michigan Republicans after the 2010 census. Plaintiffs are asking the judges to redraw state and congressional boundaries before the next round of elections in 2020. Lawyers representing Republicans in the case contend that the party’s map-making decisions were and remain legal. And they have sought to downplay private emails unearthed in the litigation that show GOP operatives openly discussing how to cement Republican advantages in Michigan races while packing Democratic voters into a limited number of districts. Dillon won the 75th District in 2010 by 682 votes after, he said, knocking on 20,000 doors in the district. But after the political maps were redrawn, he found himself representing a “super Democratic” district. Translation: Republican map makers had packed so many Democrats into his district he couldn’t lose – and he said he didn’t like it. “I knocked on virtually no doors and got 77 percent” of the 2012 vote, he said. It was actually 76 percent; he won by more than 16,000 votes. Those new maps made Dillon safe, he said, in an ultimately unsuccessful effort to create a more Republican-leaning state house seat in the outer areas of Grand Rapids. 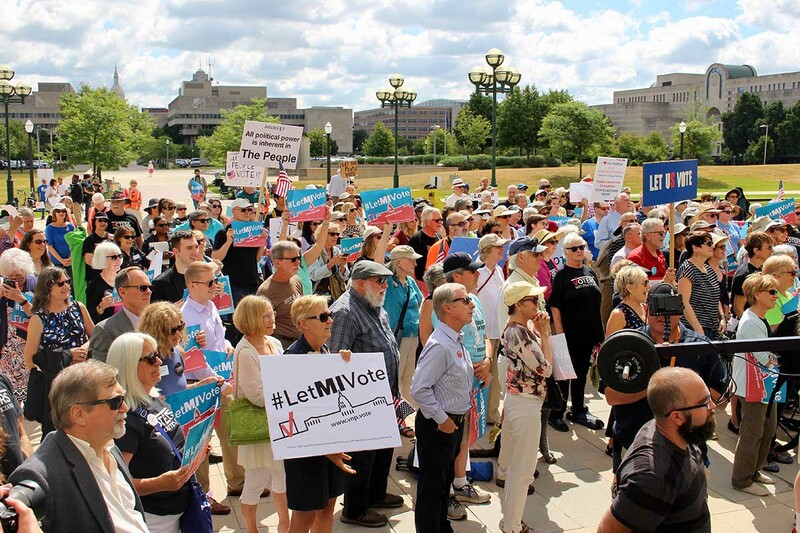 The Michigan League of Women Voters and some Democrats are challenging 34 congressional, state house and state senate seats as illegally drawn to benefit Republicans and improperly dilute the strength of state Democratic voters. The trial is being watched closely around the country, even as the U.S. Supreme Court is set to hear arguments on redistricting cases in two other states, North Carolina and Maryland. Plaintiffs’ attorneys argue in the Michigan case that Republicans consistently made partisan choices in 2011, breaking rules that would “pack” Democrats into “super Democratic” districts while “cracking” (spreading out) remaining Democrats among safe Republican seats. Until 2018, Republicans held wide majorities in the Michigan House and Senate and in the governor’s office; it wasn’t until the wave election last November that Democrats created a 7-7 tie in the congressional delegation. Despite gains in the state House and Senate, Democrats remain in the minority. Dillon, a former chairman of the Michigan Democratic Party, testified that the gerrymandered districts made it difficult for Democrats to find candidates, raise money and attract volunteers. He said many Democrats felt the districts were drawn too Republican to even bother contesting. Moolenaar went on to win with 63 percent of the vote. Defense attorney Kevin Fanning, representing state Republican lawmakers, pushed back on Dillon’s claims regarding fundraising. On cross-examination, Fanning noted the fundraising prowess of Advantage 2020, a liberal super-PAC created by the Democratic Legislative Campaign Committee to raise $70 million to target GOP redistricting efforts in various states. Dillon said he could not confirm that dollar figure. Fanning also pointed to Democrat Elissa Slotkin’s victory in November over Republican incumbent Mike Bishop in Michigan’s 8th Congressional District, noting that the Democrat outraised Bishop during the race. Dillon said the 8th was among the “cracked” districts. “But it can be done,” Fanning replied. Also Wednesday, a staff member for the State Senate Democrats testified that, on a number of occasions, GOP maps broke a set of rules that has guided Michigan’s redistricting process for over four decades, and almost always for partisan advantage. Mike Vatter, who works in information technology, took the judges on a political field trip of Michigan, going over numerous districts, often talking about individual townships. Since the 1980s, Michigan had tried to build its maps by making districts compact and contiguous and by keeping counties and municipalities intact within districts. But Vatter, who with the Senate Democrats drafted their own maps, said the GOP 2011 maps routinely broke cities apart and pulled more townships, villages and cities out of counties than were necessary. In Macomb County, the Republican-drawn maps altered two Senate seats, the 9th and 10th, that included breaking up Clinton Township. A Bridge Magazine analysis of the same data showed that the more Republican portion of the township was put in the 10th District and the more Democratic portion in the neighboring 9th District. After the redraw, the 10th was strongly Republican and the 9th was an overwhelmingly Democratic district. “That break was unnecessary,” Vatter said. “You could draw, and we did draw, districts north and south with no breaks.” But those would have been more competitive, Vatter pointed out. The legislature never voted on Vatter’s maps and he said Democrats didn’t get to see most of the GOP-drawn maps – they were largely shut out of the process – until they were submitted to committee. Testimony in the suit is expected to wrap up Thursday. It’s unclear when the judges will issue a decision in the case. Gerrymandering scares off candidates from running in some districts, really? You mean kinda like Republicans not running serious campaigns in districts created by the Voting Rights Act? Bridge is the laziest publication I think I've ever read. How about some fact checking on Dillon? I don't know if what he said on the stand amounts to perjury, but it sure as hell doesn't square with what he's said elsewhere. It should be noted that the 2018 midterm elections were an aberration. Despite heavily gerrymandered districts, several Democrats flipped reliable GOP districts. This doesn't mean that Dillon was wrong about the difficulty raising money and finding candidates to run on the Democratic ticket. The example of the Moolenar seat is a valid example. In 2018 the results should be not be interpreted to be due to fairly drawn districts. They were heavily influenced by a tremendous rejection of the party of Trump.